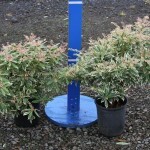 A rounded shrub with green leaves that have creamy white margins. The new growth in the spring is bright red and rosy-pink. Blooms in the early spring with pendulous clusters of white flowers. It prefers part shade to shade and a well-drained site. 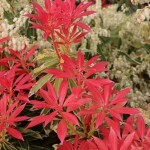 Use as an informal hedge, in the shrub border, or even in a container.